ඉතින් යාලුවනේComputer Hardware පාඩම් ,මාලාවේ අට වැනි ලිපිය තමයි අද ඔයාලට දෙන්නේ මුල් ලිපි හතම ඔයාලා කියවන්න ඇතිනේ කියවපු නැතිකෙනෙක් ඉන්නවනම් පහලින් ගිහින් ඒ හතම බලාගන්නකෝ. කලින් දවසේ අපි Computer Hardware පාඩමෙන් කතා කලේ Mother board ගැනයි. මෙහි ලිපි කීපයක්ම පළ වෙනවා. මේ එහි දෙවන පෝස්ට් එකයි. 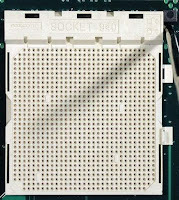 අද කතා කරන්න යන්නේ Processor socket එක ගැනයි. කාලයත් සමග Processor එක වෙනස් වූ නිසා සොකට් එකත් ඒ සමග වෙනස් වූවා. 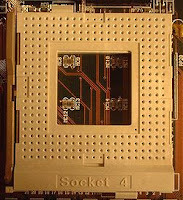 මෙය මුල්ම Processor socket එකයි. වැඩි විස්තර අවශ්‍ය නෑ රූපය පමණක් බලන්න. 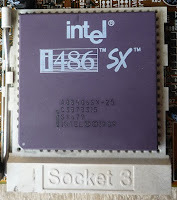 මෙම Processor හා Processor socket වර්ථමානයේ භාවිතාවන IC එකකට සමානයි. 1970 පමණ හඳුන්වා දුන් මෙය පින් 40ක සොකට් එකකි. 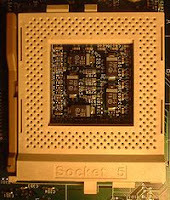 පින් 68 සිට 132 දක්වා වූ මෙය මීළඟ Processor socket එකයි. දැනටත් CMOS සඳහා මෙවැන්නක් භාවිතා කරයි. රූපය බලන්න. රූපය බලන්න. මෙය විකිපීඩියා අඩවියෙන් ගත් රූපයකි. Pin 273 සොකට් එකකි. 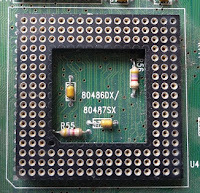 මෙය PGA (Pin Grid Array) සොකට් එකකි. 1993 හඳුන්වාදුන් මෙය P5 Pentium processors සඳහා යොදාගනී. 5-volt සහාය දක්වන මෙය Pentium OverDrive processors සඳහා සහාය නොදක්වයි. රූපය විකිපීඩියාවෙනි. Pin 320 කින් යුත් මෙය processors ගණනාවකට සහාය දක්වයි. ඒවා නම්, Intel P5 Pentium (75 - 133 MHz), Intel Pentium Overdrive (125 - 166 MHz),AMD K5 (PR75 - PR200), IDT WinChip (180 - 200 MHz), IDT WinChip-2 (200 - 240 MHz), IDT WinChip-2a (233 MHz) මෙය Socket මගින් ප්‍රතිස්ථාපනය (Replace) කරන ලදී. රූපය විකිපීඩියාවෙනි. Intel 486 සඳහා නිපදවා ඇති 235 Pin සොකට් එකකි. මෙයත් PGA පැකේජයේ සොකට් එකකි. 3.3V Socket එකකි. රූපය ගත් තැන එහි ඇත. 1994 දී හඳුන්වා දුන් මෙය බොහෝ ප්‍රචලිත Socket එකකි. Pin 321 කි. 2.5 සිට 3.5V දක්වා සහය දක්වයි. 75–233 MHz Intel P5 Pentium, AMD K5 සිට K6 දක්වා, Cyrix 6x86 (සහ 6x86MX) P120–P233 processors සඳහා සහය දක්වයි. මෙය SPGA පැකේජයට අයත්ය. මෙය AMD සඳහා යොදා ගැනේ. AMD K6-2 (300 MHz – 550 MHz), AMD K6-III, AMD K6-2+, AMD K6-III+, Cyrix MII (PR366/250 MHz – PR433/300 MHz), IDT WinChip 2 (200 MHz – 250 MHz) සඳහා සහය දක්වයි. Pin 321 කි. 2.0 සිට 2.4V දක්වා සහය දක්වයි. 1995 හඳුන්වාදුන් මෙය Pin 387 සොකට් එකකි. Pentium Pro, Pentium II OverDrive සඳහා සහය දක්වයි. 3.1 හෝ 3.3V සඳහා සහායවේ. FSB frequency 60–66MHz වේ. 1997 Slot 1 හඳුන්වා දුන් අතර 1998 Slot 2 හඳුන්වා දෙන ලදී. Slot 1 සම්බන්ධතා (Contacts) 242 සහිත වන අතර 1.3V සිට 3.50V දක්වා සහාය දක්වයි. Pentium II: 233–450 MHz, Celeron: 266–433 MHz, Pentium III: 450–1.133 GHz යන processrs හා Celeron and Pentium III to 1,400 MHz, VIA Cyrix III: 350–733 MHz, VIA C3: 733–1,200 MHz සඳහා සහාය දක්වයි. Slot 2 Intel Pentium II Xeon (400-450 MHz), Intel Pentium III Xeon (500-1000 MHz) සඳහා සහයවේ. 1.3V සිට 3.3V දක්වා සහාය දක්වයි. 1998 AMD Athlon සඳහා හඳුන්වා දෙන ලදී. Contacts 242 කි. 1.3 - 2.05 V අතර ක්‍රියාකරයි. AMD Athlon (500-1000 MHz) සඳහා සහය දක්වයි. 1999 හඳුන්වා දුන් මෙය බොහෝ කලක් භාවිතා වූ අතර contacts 370 කින් යුත් සොකට් එකකි. සහය දක්වන processors වන්නේ. මෙහි FSB 66, 100 and 133 MHz වේ. PGA වර්ගයේ සොකට් එකක් වන අතර 1.05 - 2.1V දක්වා ක්‍රියා කරයි. 2000 දී හඳුන්වා දුන් මෙය contact 462 කින් යුත් සොකට් එකකි. AMD processors සඳහාම නිපදවා ඇත. සහය දක්වන processors වන්නේ. වන අතර 1.0 සිට 2.05V දක්වා ක්‍රියා කරයි. මෙයද PGA package processor එකකි. වසර 2000 දී හඳුනවා දුන් මෙය PGA 423Pin processor එකකි. Intel Pentium 4 processors සඳහාම නිපදවා ඇත. 1.3GHz සිට 2.0GHz දක්වා Willamette core Intel Pentium 4 සඳහා සහය දක්වයි. 1.0 - 1.85 V අතර ක්‍රියා කරයි. FSB frequency 400 MT/s වේ. FSB frequency 400 MT/s, 533 MT/s, 800 MT/s වේ. Intel Celeron mobile processors සඳහා යොදාගත් සොකට් එකයි. PGA 495 contact සහිතවේ. 2003 දී හඳුන්වා දුන් මෙයද AMD processors සඳහා සැකසූ එකකි. Contact 940 සහිත මෙය PGA වන අතර 0.8 - 1.55 V අතර ක්‍රියා කරයි. 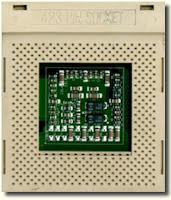 FSB frequency 200 MHz System clock හා 800/1000 MHz HyperTransport link වේ. සහය දක්වන Processors වන්නේ AMD Athlon 64 FX හා AMD Opteron ය. 2004 දී හඳුනවා දුන් මෙය Mobile processor එකකි. සොකට් එකේ contact 479 කි. එහෙත් ප්‍රොසෙසරයේ ඇත්තේ පින් 478කි. Intel Pentium M, Intel Celeron M සඳහා යොදාගනී. FSB 400 MT/s, 533MT/s වේ. Athlon XP-M processors සඳහා යොදාගනී. Contact 563 කි. Mobile processor එකකි. FSB 800 MHz වේ. සහය දක්වන්නේ Athlon 64 X2; Turion 64 X2; Mobile Sempron; Turion 64 සඳහාය. 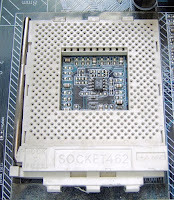 Athlon 64, Athlon 64 X2, Athlon 64 FX, Opteron, Sempron, Phenom ය.
Socket AM2+ ද මේ හා සමානය. 2006 දී හඳුන්වාදුන් මෙම සොකට් එක Contacts 1207 කින් යුක්තය. සහය දක්වන්නේ Opteron 2xxx, 8xxx series, Athlon 64 FX FX-7x series සඳහාය. මොබයිල් සොකට් එකකි. Intel සඳහා සහය දක්වයි. කන්ටැක්ට් 478 වේ. Intel Atom Processors සඳහා භාවිතා වන්නේ මෙම සොකට් එකයි. මෙහි FSB 400 MT/s, 533 MT/s අතර වන අතර Contacts 441 සහිතයි. හඳුන්වා දී ඇත්තේ 2008 දීය. Intel Core i7 (9xx series), Intel Xeon (35xx, 36xx,55xx, 56xx series), Intel Celeron P1053 යන ඒවායි. Intel Celeron, Intel Core i3, Intel Core i5, Intel Core i7, Intel Pentium, Intel Xeon යන ඒවා වේ. මෙයට අමතරව Server Processor socket ගණනාවක් ඇතත් ඒවා පිළිබඳව මම සඳහන් කර නොමැත. අද නම් පොස්ට් එක ගොඩක් දිගයි වගේ. එහෙත් දැන් අපි මේ සොකට් සියල්ල ගැන දන්නවා. රූප නොමැති ඒවා අඩුවෙන් භාවිතා වන්නේ. නිතර භාවිතා වන සියල්ලේම රූපයක් ඇතුලත් කර ඇත. මේවා පිළිබඳව මෙම පොස්ට් එකෙන් කර ඇත්තේ හඳුන්වා දිමක් පමණි. එහෙත් මේවා දීර්ඝ වශයෙන් සාකච්ඡා කරන්න බලාපොරොත්තුවක් නෑ. නමුත් ඉදිරි ලිපි වලින් වැදගත් වන දැනට භාවිතා කරන ඒවා ගැන තව විස්තර ලබා දෙන්න බලාපොරොත්තු වෙනවා. එහෙමනම් මීළඟ පොස්ට් එක වෙන් වන්නේ මෙමරි (Memory Slot) සඳහාය. මෙම ලිපි පෙළට අළුතින් කියවන්න ආ අය පැරණි පොස්ට් කියවා එන මෙන්න ඉල්ලමි.